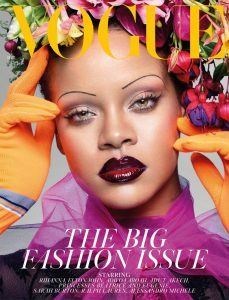 –Rihanna looks fantastic on the cover of British Vogue. -Speaking of Vogue, Beyonce is not only covering Anna Wintour‘s last Vogue issue, she’s reportedly assuming complete control. -While the Guardians of the Galaxy cast is signing open letters in support of James Gunn, their fellow Avengers Chris Evans and Chris Hemsworth reportedly unfollowed him. -I kind of love that this nonsensical Tom Cruise interview answer has gone viral. -Meanwhile, Mission Impossible: Fallout launched with a series-best opening of $61.5 million. -Speaking of podcasts, it’s super rich that Marc Maron might join the Joker cast. I was just listening to his episode with Paul Rudd and he kept inferring that Rudd just did Ant Man for the paycheck because superhero movies are dumb. –Robert Pattinson and Suki Waterhouse are dating. Huh. –Billy Talent, City & Colour, Pup and more are pulling together a benefit concert for the Danforth. -Following an intense social media campaign by Timeless fans (who call themselves Clockblockers), NBC announced they’re wrap up the show with a two-hour movie. –Stephen Colbert called Les Mooves “my guy” but still took him to task in last night’s monologue, while Julie Chen defended her husband on The Talk. -Meanwhile, Meredith Vieira said “I never personally heard anything, but that means nothing. Somebody can be one way with you and very different with another person.” Which ties in perfectly with this Vox piece. -Celebs reading mean tweets about themselves is a big thing, but I’d much prefer to watch Christine Baranski reading nice tweets people wrote about her. That last one made me a little teary. -Literal ball of sunshine Gina Rodriguez is probably engaged. -Well, this is depressing: An annual report shows no significant improvement in film representation of women, people of color, LBGT characters or characters with disability over the past decade. -In her Vulture interview, Kristen Bell teases The Good Place’s new season, talks about her plan for a Bad Moms sequel, and reveals what it’s like to text with Cher. –Kim Kardashian was told she looked anorexic and took it as a compliment. That’s swell. -I love that Seth Rogen is becoming the voice of Canadian transit. First he took over for the Vancouver system when they dropped Morgan Freeman following his sexual harassment allegations, and now he’s doing Toronto’s subway announcements. This might make me 0.04% less annoyed when someone’s being scolded for blocking the doors. –Alan Alda revealed he has Parkinson’s disease in an appearance on CBS This Morning Tuesday. -One of the biggest disappointments of the TV season was Dietland, which started out so strong but got so bad that I just stopped watching a few episodes ago. According to reviews, it didn’t rebound in this week’s finale. -The new Venom trailer shows off much more of Tom Hardy’s take on the Marvel anti-hero. It still looks bad.